The James River is a typical coastal plain estuary draining to the Chesapeake Bay. 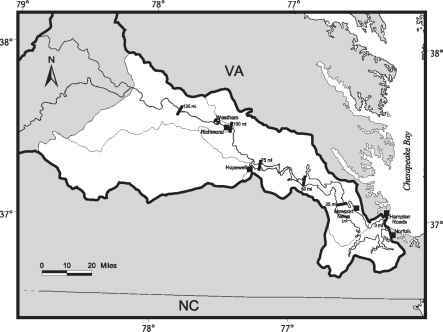 The variation of depth, cross-sectional area, and tidal velocity in the James River from Richmond to the Chesapeake Bay is significant. For example, the cross-sectional depths vary from about 10 feet in areas with shallow side embayments to 25 to 30 feet in the deepwater channel. The river generally widens in the downstream direction, although natural constrictions occur at several locations. 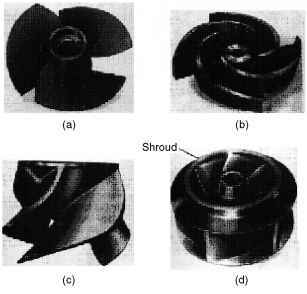 Cross-sectional area varies markedly, from the deep, narrow channel in the upstream section to broad, shallower profiles downstream. Figure 9-1 Hydrologic Region 2 and the James estuary watershed. relatively small intervening drainage area provides a nominal increase in in-stream flow between Richmond and the confluence with the Appomattox River. Water is withdrawn from the James River for both municipal and industrial purposes and then returned to the river. Treatment is provided by all users except those who use the water solely for cooling purposes. Long-term interannual and mean monthly trends in streamflow for the James River near Richmond, Virginia, are shown in Figures 9-3 and 9-4. Figure 9-3 Trends of mean, tenth, and ninetieth percentile statistics computed for summer (July-September) streamflow for the James River (USGS Gage 02037500 near Richmond, Virginia). Source: USGS, 1999.